A Basque religious composer who made use of modernist techniques, Tomás Garbizu (190189) excelled at the composition of vocal works. 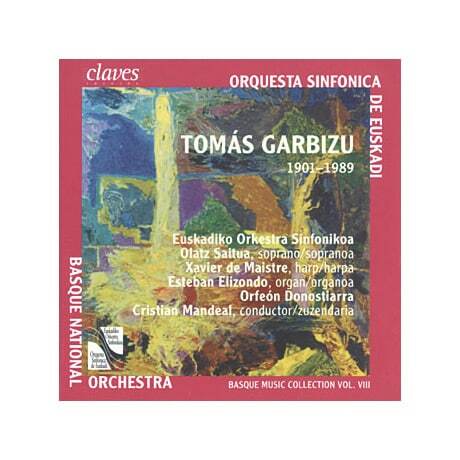 On this anthology, Garbizu is well served by soprano Olatz Saitua and the Orfeón Donostiarra Choir on Ave Maria, Cinco Canciones Vascas ("Five Basque Songs") for soprano and orchestra, the stirring Misa Papa Juan XXII ("Mass, Pope John XXII"), and Un Grano de Trigo, Por un Granito de Oro ("A Grain of Wheat for a Nugget of Gold"), with lyrics from a poem by Rabindranath Tagore. Garbizu's lifelong passion for organ contributes to the 1982 piece Final for harp, organ, and orchestra; Esteban Elizondo is the organist and Xavier de Maistre the featured harpist, backed by the Euskadiko Orkestra Sinfonikoa (Basque National Orchestra).